1. It is manual measurement, there may be 1-2cm error. And item color displayed in photos may be showing slightly different on your computer monitor since monitors are not calibrated same. 2.This product is made from 100% natural wood, the color may be different from the pics, also maybe there are some of the natural wood grain and cracks on it. 【PERFECT SIZE】 With the size of 25*9*50cm（9.84" x 3.54" x 19.68"), suitable for most of the small birds. 【ENJOY THE FUN】Fun to play, climb and rest,relieves boredom and increases activity level, Perch toy provides your pet with a nice and cozy place to play and exercise. It can relieve your bird's loneliness.A few hours of mental stimulation and a solid physical game will benefit your birds. 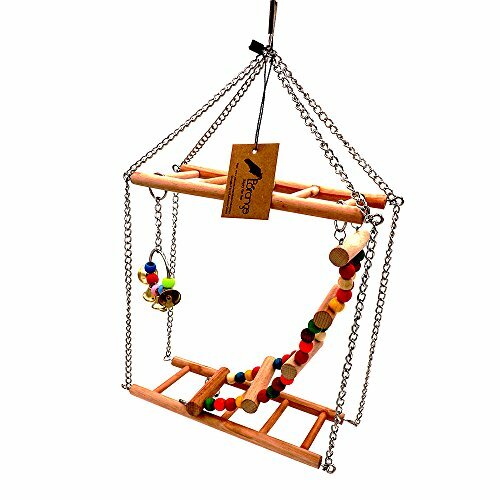 【DEVELOP BIRDS BALANCE】 The hanging swing encourages birds to climb, play and hop from rung to rung. This will help develop their balance abilities and achieve optimal foot health. 【EASY TO CLEAN】Easy to clean and durable in use. COLOR MAY VARY DUE TO BEING A HANDMADE PRODUCT, HOPE YOU CAN KINDLY UNDERSTAND. If you have any questions about this product by Boranges, contact us by completing and submitting the form below. If you are looking for a specif part number, please include it with your message.